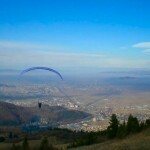 Brasov is a very good flying spot in Romania, he has high mountains and hills all around the area, easy to get there and good recovery conditions. 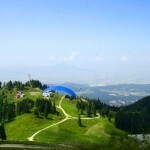 Landing : N 45° 35′ 34,1′ E025° 33′ 21.6′ , at an altitude of 1150 m from the sea level, in Poiana Brasov Ski resort. 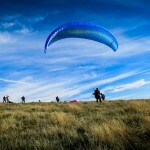 GPS coordinates : take off : 45°35’22” (45.5895)N; 25°39’51” (25.6642)E – Elevation : 1172 m.
landing : 45°36’18” (45.6052)N; 25°39’33” (25.6593)E – Elevation : 659 m.
Take off : Takeoff place is at an altitude of 1172 m above the sea level, the place is 20 m away from the cable car end station. Landing : The landing place is in a huge area, suitable for all level of training. Going there : Coming on DN1 from Bucharest to Brasov, as soon as you enter the city of Brasov, after the BMW car dealership you turn right and follow a gravel road, which will take you to the Bunloc Chair Lift.